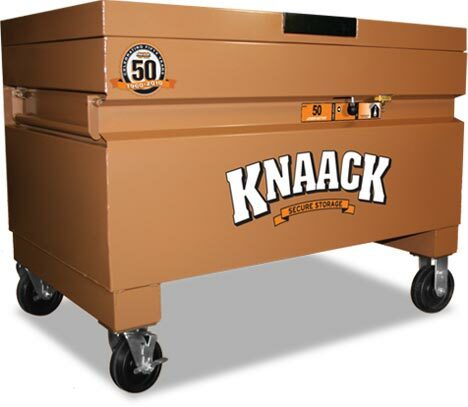 To celebrate Knaack turning 50 years old, they have come out with a special limited edition Knaack Box that is cleverly named Model 50. The Model 50 is more then just a box with special edition labels all over it that are sure to make your co-workers hate you even more; it is the ultimate jobsite storage box with all the latest and greatest. Just check out the features below. *Bonus Alert* Upload a photo of your own Knaack Box using the entry form, and Knaack will send you a free 50th Anniversary hat. If you are liking what your are reading, you can fill out the entry form at Knaack Fifty to enter to win 1 of 7 Model 50 jobsite storage chests that Knaack will be giving away once every 50 days. If you have broken any mirrors, walked under any ladders, or have had any black cats walk across your path, your chances of winning might not be good enough to win. That's OK though, you can head over to your local dealer and pick up a Model 50 chests up until the end of this year.